Our high efficiency 600 ton forging press is capable of producing 500 forgings per 8 hour shift with single man operation. Cutting off aluminum bar into billets prior to being faced to a good finish to produce a high quality forged surface. Skimming the billet before heating to the correct temperature for forging. This operation ensures an excellent finish inside the forging. One of the machining jigs on one of our 4 axis machining centres. Measurement of valve pocket co-ordinates on our CMM (Co-ordinate Measuring Machine). This machine allows co-ordinate measurements to be taken to an accuracy of 1/10 of a micron (.0001mm). 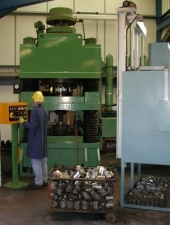 One of the operations of gudgeon (wrist) pin manufacturing. All pins are fine bored to the highest accuracy and finish possible. One of the oldest automatic machines in the factory still gives excellent results machining the drainage slots into our oil control rings. Our 3D solid modeling package allows us to know exactly what the piston will look like before going into production. It can also calculate the weight of the finished piston to within 1/10 of a gram. Setting up the profile and ovality inspection equipment. This can check an infinite number of profiles in the radial and longitudinal aspects of the piston skirt allowing us to log results for future reference should any modifications be required. Forgings are subject to accurate hardness testing to ensure optimum strength in all applications. Gudgeon (wrist) pins are also subject to stringent hardness testing. Measurement of surface finish is done using ultra high accuracy equipment. A steel rule has been placed by the measuring head in an attempt to show the scale of the measuring tip.